Greetings YDEKC Members & Friends! YDEKC’s 2019 is off at a clip! 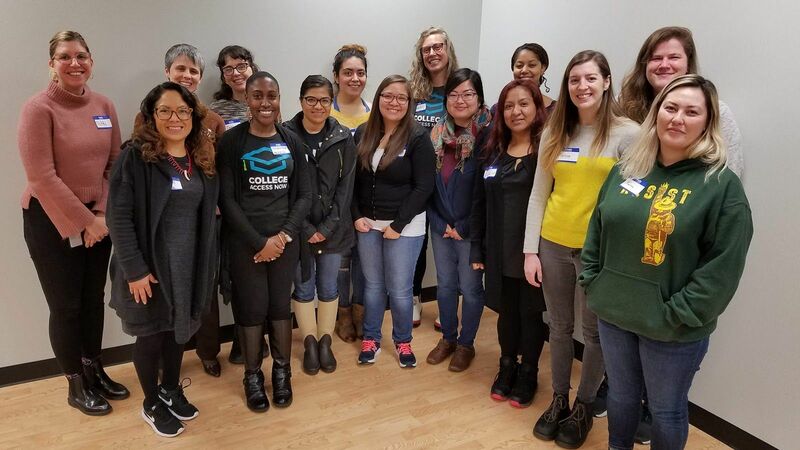 In January, we hosted Advocacy Day for Youth Development and Expanded Learning in Olympia in partnership with School’s Out Washington and SOAR, launched our Racial Equity in the Youth Development Field Conversation Series, and opened applications for our Whole Child, Whole Day Mini-Grants and a brand new SEL School-Community Partnerships Cohort. If you’re a YDEKC member, please share your feedback on our past and help shape our future work by completing our Annual YDEKC Member Survey. Read on for more ways to get involved, advocate for young people, and improve your practice. We hope to see you soon. Don’t forget! Make sure your programs are updated in the Youth Program Directory, to Like us on Facebook, and to follow us on Twitter to stay up to speed until our next newsletter. Use the hyperlinks below to jump to a specific section of our Field Notes. Whole Child, Whole Day: We convene and participate in cross-sector collaborations to improve the alignment of efforts supporting children and youth in King County. Whole Child, Whole Day Mini-Grants- proposals due March 4th! YDEKC, with generous support from the Bill and Melinda Gates Foundation, is excited to provide funding to community-based organizations and schools for projects to be implemented in 2019 that support social and emotional learning (SEL) & youth success across the day. Eligible applicants can request awards ranging from $5,000-$10,000 to support projects that include, embed, and connect youth, family, and/or community voice, perspective, and expertise in whole child, whole day efforts. Click here for the RFP and Frequently Asked Questions to apply and for more information. Applications due March 4th. Did you miss YDEKC’s GoTo Meeting of our recently released report Social and Emotional Learning Landscape Scan: Systems & Structures that Support Whole Child Outcomes in the Road Map Region? Don’t fret, we now have the recording on our website! Check out YDEKC’s Executive Director Jessica Werner and SEL Strategy Senior Manager Mona Grife sharing regional themes from the scan, examples of SEL-related efforts, and recommendations for strengthening whole child, whole day efforts. The Whole Child, Whole Day Advisory Committee, staffed by YDEKC, with committee members from community-based organizations, local government, and more kicked off their first meeting on January 16th. The committee meets monthly and is committed to building cross-sector partnerships and systems that cultivate supportive, engaging, and inspiring learning environments for all young people. The team will advise YDEKC’s SEL strategy and steer activities such as Whole Child Whole Day Symposia and SEL mini-grants. You can check out the committee’s page on the Road Map Project website. Advocacy: We advocate for policy changes that address youth development field needs and issues impacting King County youth. 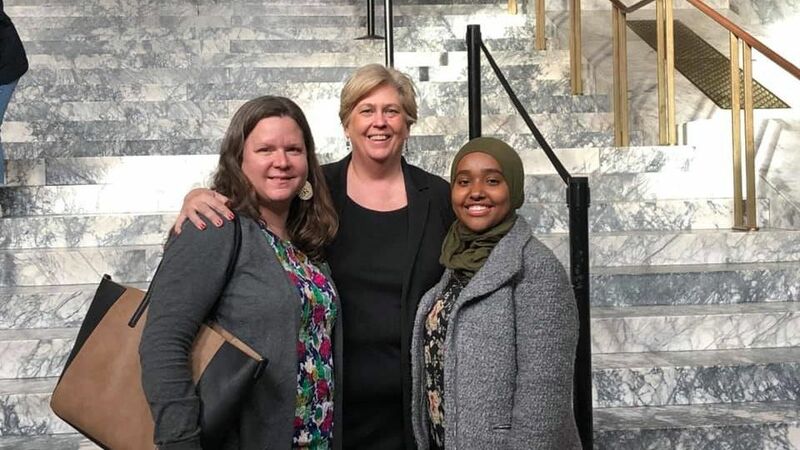 YDEKC’s Executive Director Jessica Werner, Public Policy Manager René Murry, and Policy Research Assistant Hikma Sherka on the Capitol Steps, Advocacy Day for Youth Development and Expanded Learning. Join Washington Nonprofits and YDEKC at the Governor’s Mansion to mingle with elected officials, connect with peers from across the state, and celebrate the contributions that nonprofit organizations make to our communities. Learn more here and register here. Registration closes February 4th. Photo ID required at door. Join the Children’s Alliance for an energizing and powerful day of action, including training, kid and youth-led march to the Capitol, rally on the Capitol Steps, and opportunities to meet with your legislators. Buses available from Seattle/South King County/Tacoma. Interpretation available. Learn more here. Register here. Join The Mockingbird Society for Youth Advocacy Day! Join more than 300 youth advocates and adult supporters raise a unified voice. Help transform foster care and end youth homelessness by sharing with policymakers about why these issues are important to our communities. Learn more here and sign up here! Join Washington Nonprofits for Building A Movement: Nonprofit Advocacy Workshop! Based on the Build A Movement toolkit to be released by Washington Nonprofits in early 2019, this workshop presents the three main chapters of nonprofit advocacy: Foundations, Everyday Advocacy, and Step-It-Up Advocacy. Learn more and register on Washington Nonprofits’ Learning Calendar. Field Building, Funding, and Training Opportunities: We build tools, disseminate effective practices, and foster skills that support leadership, racial equity, and organizational development. New School-Community Partnerships Cohort launching in March – apply now! YDEKC’s SEL School-Community Partnerships Cohort is a 16-month peer learning cohort for community based organization coordinators and managers building sustainable school-community partnerships and programs supporting the social emotional development of youth in grades Kindergarten through 12th grade in King County. Participants will learn and apply strategies and tools from our School-Community Partnership Toolkit, which provides supports for multiple stages of partnership: Assessing Readiness, Mapping Needs and Assets, Establishing Partnership, Working Together, and Evaluating Programs. The program will begin in March 2019 and end in June 2020. Click here for an application and Frequently Asked Questions. Apply by March 4, 2019! GiveBIG 2019 is powered by 501 Commons in partnership with Encore Media Group and CiviCore. Since 2011, the popular giving day has raised more than $113 million for nonprofits in our region. To learn more and register your organization, visit GiveBIG 2019’s website today! Registration must be completed by March 29th. BoardTalks™ is a unique learning opportunity offered to board members from all types and sizes of nonprofit organizations who meet in a confidential and collegeial setting to discuss “board best practices” and to solve current organizational problems. The four 2.5 hour monthly meetings allow time for participants to acquire and practice new skills in order to be the best possible board members. More info available here. Online registration is available here. The Ready by 21 National Meeting brings together more than 500 local, state and national leaders who like you are committed to improving partnerships, policies and practices for children and youth. These leaders manage change at all levels – from state policy coordination and community-wide cradle-to-career efforts to out-of-school time systems, single-issue coalitions and neighborhood-based initiatives. The eighth annual National Meeting will be held in Seattle, Washington and will feature plenty of engaging and exciting sessions. Learn more and register here! The mission of TEDxSeattle is to create events and gatherings that are self-sustaining and enrich their audience, speakers, volunteers, and partners. The all-volunteer staff seeks to create events that are educational, inspiring, and motivational. The first TEDx Youth event May 4th is a unique day long event of curated and coached talks, demonstrations, and performances showcasing inspirational work from all areas of our community. The goal over the course of the day is to provide a catalyst to empower at least some of those attending to envision and explore a new reality for themselves, their community, possibly the world. Speaker applications are available here. Volunteer opportunities–for youth and adults–available here. Questions or want to partner? Contact Renee Codsi. Check out 501 Common’s Learning Connections page for learning opportunities and career resources designed for community volunteers, people who want to work in the nonprofit sector, and current nonprofit professionals. Visit often to learn about new conferences, training, leadership programs, and career development opportunities. Communities in Schools of Seattle is seeking an Executive Director! 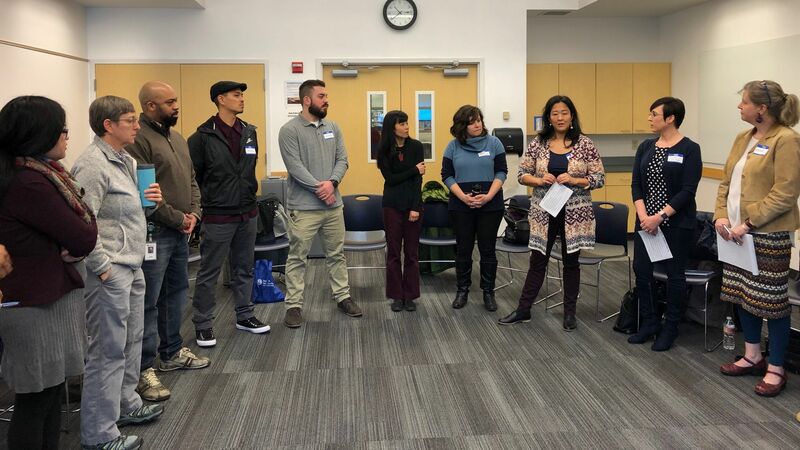 Communities in Schools of Seattle is seeking a proven, dynamic leader for Communities In Schools of Seattle (CIS of Seattle), a successful non-profit organization serving students and families in Seattle Public Schools. The successful candidate must believe in the tenants of equity, diversity and social justice, understand the intersection of race and poverty, and operate under the core principles of antiracism through their daily actions within our communities and with our staff and board members. View the full job description here. FEEST Seattle is hiring an Executive Director! FEEST is searching for a fierce, visionary, and skilled Executive Director (ED) with on-the-ground grassroots organizing experience, a strong equity lens, and extensive knowledge of the strengths and abilities of young people of color in South King County. The new Executive Director will be a dynamic, creative, heart-centered, culturally-engaged, and empathic leader with the capacity to envision and strategically plan for the future direction of the organization. The ED fosters a culture of collaborative accountability and transparency across the organization and has a strong ability to cultivate radical joy, build an inclusive and vibrant community, and inspire action. View the full job description here. Neighborhood House is seeking a new Executive Director! Founded in 1906, Neighborhood House is one of the oldest social service agencies in the Puget Sound region. Their mission is to partner with diverse individuals and families to build community and achieve their goals for health, education and self-sufficiency. They are looking for someone with passion, commitment, humility, curiosity and a desire to work hard on behalf of a noble and challenging mission. View the full job description here. Thank you for the continuing to work together to advance the youth development field. We hope to see you soon!